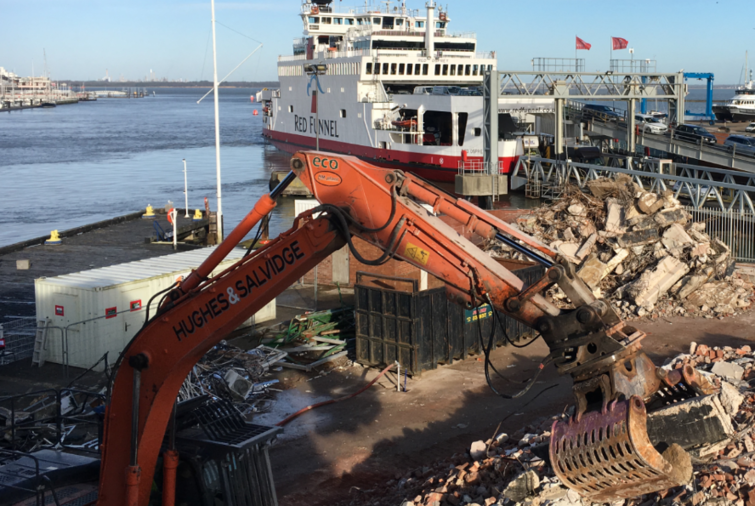 Hughes and Salvidge were appointed by Red Funnel and their Project Managers, Gleeds, to the role of Principal Contractor for the demolition works at Trinity Wharf in East Cowes on the Isle of Wight. As part of the first phase of Red Funnel’s plans for this area, we were contracted to demolish the existing structures, after asbestos removal and soft strip, and then remove the slab and hard-standings. The site was situated immediately on the Quay so extra care had to be taken to ensure that the water remained free from any materials arising from the demolition works. We also had to consider our stockpiling methods from the demolition arisings and use of plant, to ensure they were situated at, or operating in, suitable distances from the quay wall in all locations to prevent any overloading. A detailed traffic management plan also needed to be put in place as the Quay remained operational in the immediate vicinity of the site. The roads needed to be clear and serviceable at all times. Traffic movements to and from site were restricted to times of the day outside of the usual rush hour traffic in both mornings and evenings. Noise and vibration were also controlled to minimise inconvenience to the surround businesses, residents and general public. A fire hose was utilised to ensure nuisance dust was kept to a minimum and we erected Heras fencing with debris netting around the perimeter of the site to also prevent the spread of dust and foreign object debris. Despite the arrival of some inclement weather during works, the project was finished to the complete satisfaction of the client.